On Monday the 21st of January, WBro Roger Flitcroft PAGDC celebrated his 50th Masonic Anniversary in St Aidan Lodge No.6339, supported by nearly 70 Brethren. This included an extended deputation, headed by the Assistant Provincial Grand Master WBro Alan H Kirwilliam PAGStB and supported by Grand Lodge Officers, District Team Members and Acting Officers of the year. The support was so great that the ProvDepGDC WBro Leigh Rickett, had to reduce the number entering into the Lodge with the APGM down to 18 from above the mid-twenties. After receiving greetings, WBro Kirwilliam was offered and accepted the gavel of the Lodge from the Worshipful Master WBro Brian Williams, beginning by introducing the members of the deputation. 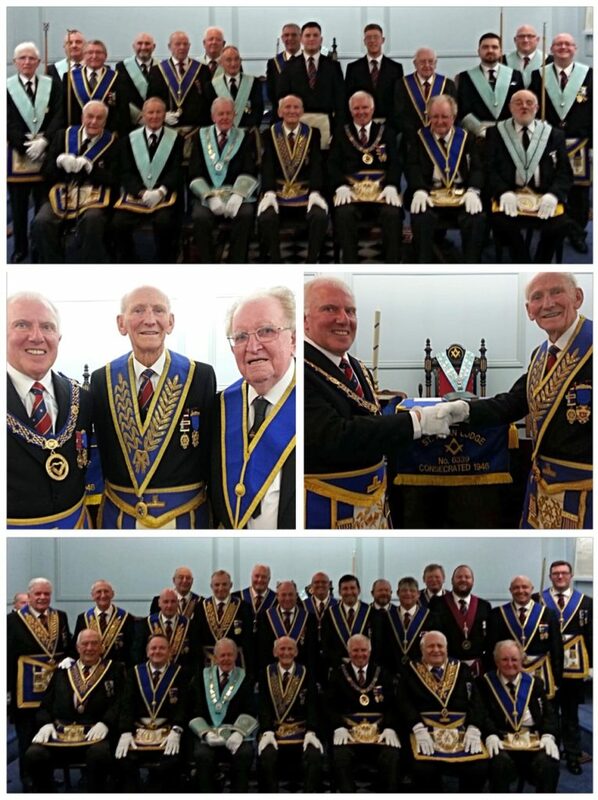 WBro Roger Flitcroft was duly placed in the Lodge by the ProvDepGDC for the celebration to begin. 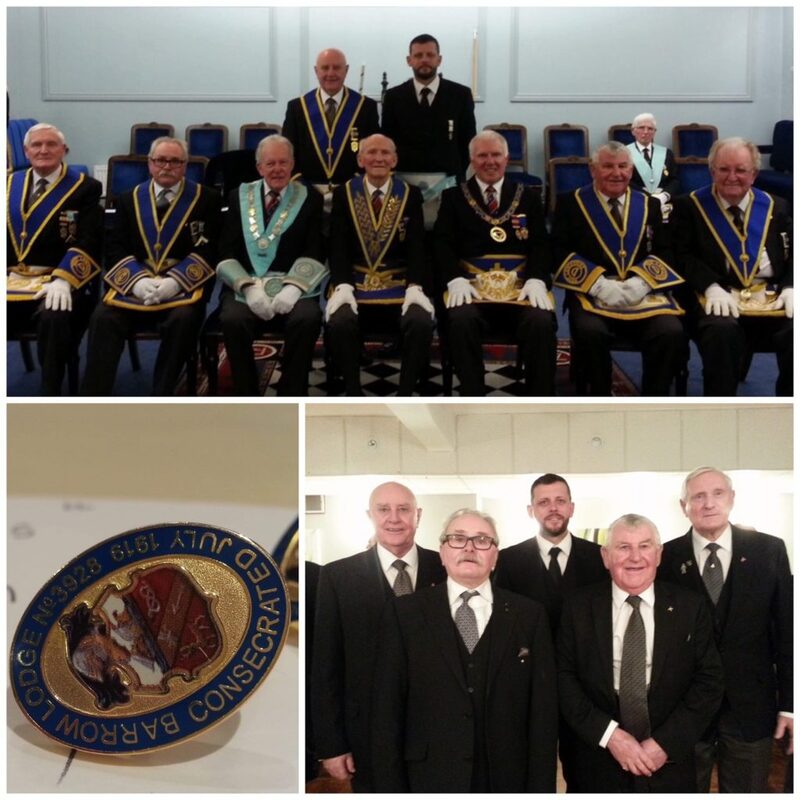 Five members from his Mother Lodge in Barrow-in-Furness, Barrow Lodge No.3928, the Lodge of Rogers Father and Brother, had come to support Roger and proceeded to read the minute from his Initiation in December 1968. Despite living in the Preston area, Roger regularly travelled to Barrow for meetings and practices usually always on the last minute and stayed with his parents, commuting back the morning after. WBro Gordon Hunter PProvSGW then gave a wonderful tribute to Roger, the full transcript can be seen HERE. Excerpts include Rogers early life in Barrow-in-Furness, his time on the open seas starting and progressing from a Cadet Officer with the Blue Star Line, subsequent career in Highways becoming a Chartered Engineer, his decades long service with the Samaritans and Scouting culminating in him being awarded the MBE in 2016 for service to Scouting, the Samaritans and Freemasonry. WBro Kirwilliam then proceeded to discuss the world as it was in 1968, quizzing the Brethren in attendance on music, film and politics of the time, before turning his attention back to our Celebrant to focus on his Masonic achievements which, just as a snapshot and not counting his enormous efforts in Lodge and Chapter life, included service as the District Secretary and District Chairman in the Accrington District, Hon Secretary of the East Lancashire Masonic Charity, the Northern Area Amalgamations and Closures Officer and most importantly, mentor and friend to all. 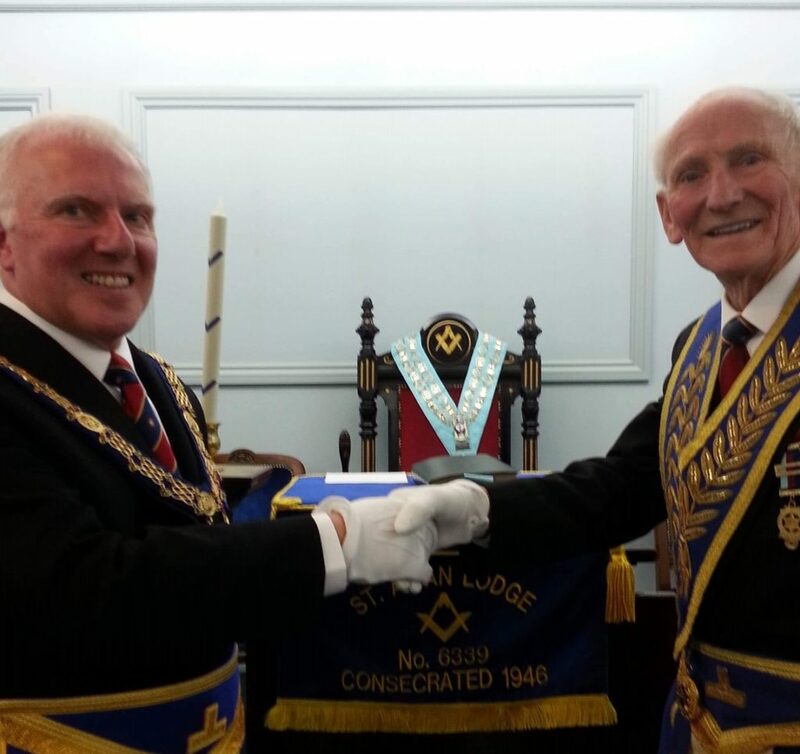 The Assistant Provincial Grand Master presented WBro Flitcroft with a personal letter from the Right Worshipful Provincial Grand Master Sir David Trippier, followed by his illuminated Certificate acknowledging his five decades of Masonic Service. Roger was then perambulated around the Lodge to the acclaim of all present. The District Chairman WBro Dave McGurty presented Roger with a personal lapel pin marking Rogers 50-year service, a small gift from the District to mark a huge contribution. 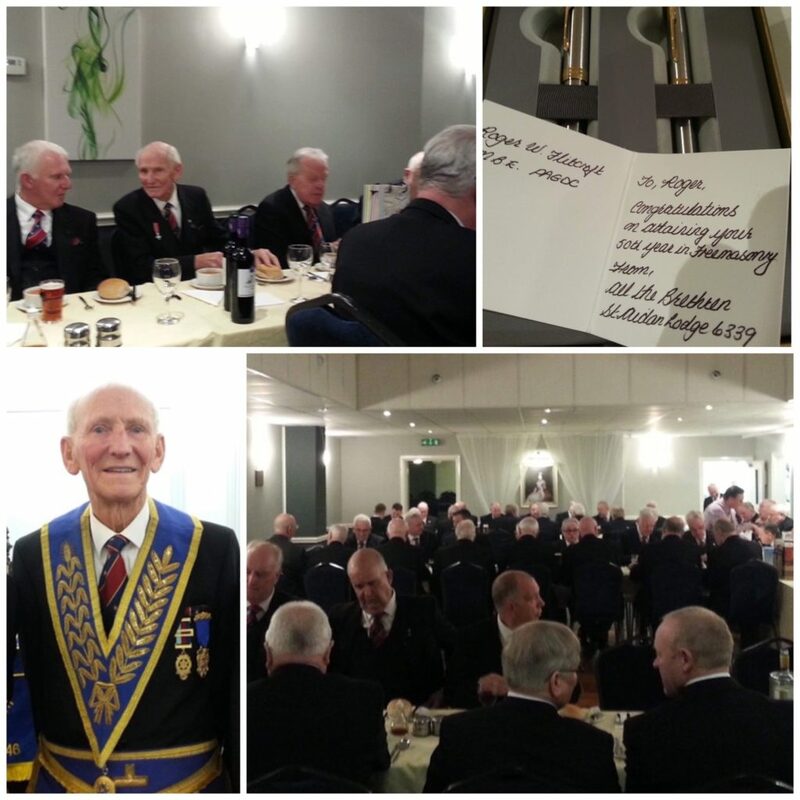 At the very full Festive Board, the toast to WBro Flitcroft was given by the Lodge DC WBro Bob Allan, who on behalf of the Members of St Aidan Lodge, presented Roger with a special Parker Pen set and bouquet of flowers for Joyce, in appreciation of them both. Responding to the toast, Roger, self-deprecating as always, made reference to what had been said of him, talking about some of his experiences during the past 50 years, Masonic and Non Masonic, including receiving his MBE in 2016. Effusive in his thanks for all who had made the evening possible and supported him, he was deservedly applauded by all at the Festive Board.